The Town of Reading is celebrating its 375th birthday in 2019. Next spring there will be a week-long commemoration including events for the whole family. It’ll be here before you know it! Our next fundraising event is coming up fast. On Friday, March 8th you are invited to a trivia night at RCTV Studios (557 Main Street, Reading) at 7:00 pm. Tickets are $20 each or $120 for a table of six. If you’re not part of a team, we’ll assign you to a table. Light snacks will be provided, but please bring your own snacks or dinner to enjoy during the night! Cash bar – free soda/water. For more information, and to learn about upcoming events, like our Facebook page, and check out our website. Calling local artists! In 2019, the Town of Reading turns 375 and we want to “Paint the Town.” Local artists from grade 6 through adult are invited to submit a two-dimensional work of art that illustrates the life and times of our vibrant and historic town. It can be of a building, people, or a scene that captures some essence of Reading, from the present or back over our 375-year history. Artwork will be displayed all around town at various venues from May 31 – June 15 as part of the Reading 375 celebrations. An Opening Reception will be held Wednesday evening, June 5, at the Pleasant Street Center. Ace Foulds, a member of the Reading 375 Steering Committee and longtime member of Walkable Reading, is looking forward to the event, which will get residents out and about in town, and give everyone an opportunity to see and celebrate the many talented artists who live in Reading. “Walking Reading is great anytime. Walking Reading to see locally created art is truly spectacular,” says Foulds. Reading, MA — On October 4, 2018, The Reading 375 Steering Committee was delighted to receive a $1,000 grant from the Cummings Properties Client Directed Giving Program, to support the celebration of Reading’s 375th anniversary. 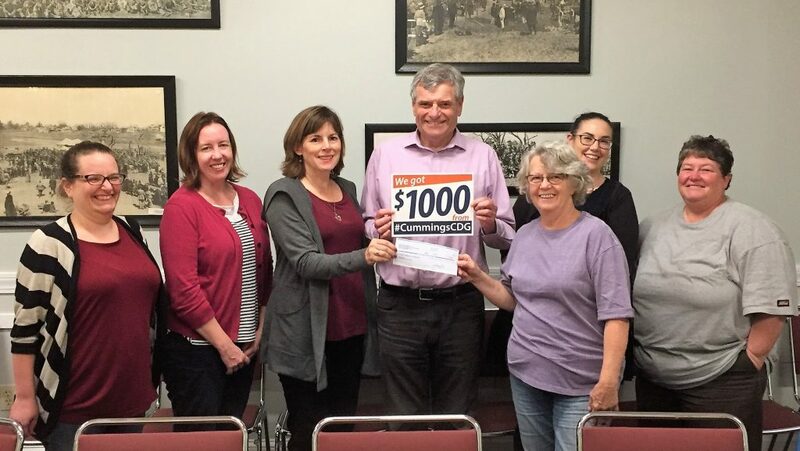 The Client Directed Giving Program allows Cummings Properties to honor the commitment of its long-term clients and give back to the towns and cities that support its business operations. The 375 Committee is grateful to Cummings Properties for their generosity and to Tom and Sarah Brukilacchio of Innovations in Optics Inc., who requested the grant. Members of the Reading 375 Steering Committee accept a $1,000 grant from the Cummings Properties Client Directed Giving Program #CummingsCDG. (l-r) Amanda Foulds, Jeanne Borawski, Sarah Brukilacchio, Alan Foulds, Ace Foulds, Catherine Robertson, and Laura Gemme. The Reading 375 Steering Committee is planning a two-week long celebration of Reading’s 375th anniversary between May 31 and June 15, 2019. The celebration will include a town-wide art show, concerts, community events, and more. Residents are encouraged to visit reading375.com. In celebration and recognition of the Town of Reading’s 375th Anniversary and the Reading Public Library’s 150th Anniversary, the Reading Public Library is seeking a candidate to serve as a Photographer-in-Residence to capture the unique life and culture of Reading over the course of one year (2019). The short-term goal is to continue adding the efforts to capture and preserve a photographic record of Reading for a 12 month period. The long-term goal is to continue this project for a period of years, with different photographers who will document changes in the town over time. The position of Photographer-in-Residence will include a $1,000 stipend, and the term will run from January 1, 2019, to December 31, 2019. Anyone interested in serving in this position should submit a statement of vision for their year-long project and a sample portfolio of photographs by Friday, November 9, 2018. The statement of vision and sample portfolio can be dropped off at the Reading Public Library’s Borrower Services in print and/or in digital form on a thumb drive. This year’s winner will be announced by Friday, December 14, 2018. Positions are open to all ages from high school and up. Positions last for a one-year term, from January 1 to December 31. The Photographer-in-Residence will receive a stipend of $1,000 for the year, half of which will be awarded at the beginning of the term and half at the end. The Photographer-in-Residence will be required to submit twenty-five photographs every three months for a total of 100 photographs taken throughout the year. Each photograph should capture Reading’s life and culture in some way and must include information about each photograph (title, date, description, identification of people and events in the photographs, etc.). Photographs can be submitted in digital and/or printed form. Anyone interested in applying for the position must submit a statement of vision for their year-long project and a sample portfolio of photographs in print or in digital form on a thumb drive. A committee will decide who will be awarded the position. Applicants do not need to be Reading residents, but they need to be willing to engage enough with the Reading community to produce results. All photographs submitted as part of the year-long project become the property of the Reading Public Library. Please contact the Reading Public Library (rdgadmin@noblenet.org) or visit www.readingpl.org for more information. We are looking for help staffing our booth at the Reading Fall Street Faire this Sunday. Night Before the 4th, A Great Success! Author Reading 375Posted on July 4, 2018 November 6, 2018 Categories AnnouncementLeave a comment on Night Before the 4th, A Great Success! Night Before the 4th Tonight! Join us tonight for a great event! Bring a picknick dinner to the park and enjoy music by Edward Dee and Ken Gordon. The movie starts at dusk. Reading 375 commemorative shirts will be available for sale! A special thank you to Reading Rotary, RCTV, Walkable Reading and Reading Recreation for helping out! Author Reading 375Posted on July 3, 2018 November 6, 2018 Categories AnnouncementLeave a comment on Night Before the 4th Tonight! The Reading 375th Celebration committee presented its preliminary plans to the Select Board at the board’s meeting on May 29. Committee Chair Philip Rushworth reported that arrangments are being made for a two-week celebration from May 31-June 15 of 2019 and will include a gala opening event, a porch fest, and an expanded Friends and Family Day with fireworks to end the two-week period. “If you were here for the 350th, you remember it.” Rushworth stated, “We want this celebration to be like that.” The committee is working with groups in town such as the library, the YMCA, the Lions Club, and the Pleasant Street Center to prepare more events for the two-week celebration. A “365 Days to the 375th” meeting at RCTV this Thursday, May 31 is scheduled for anyone interested in helping plan the event. Rushworth also informed the board about a Trivia Night on June 8 at 7:00 pm at RCTV that will raise money for the celebration. More information about Reading’s 375th birthday celebration can be located at reading375.com. The Select Board voted 5-0 to approve a waiver for the 375th Celebration committee to hold a “Night Before the Fourth” event at Memorial Park on July 3, from 6:00 pm to 10:30 pm. The park normally closes at 10:00 pm. The event will include live music and will culminate in a movie shown on a giant screen in the park. The event is free to the public. “Wilmington does fireworks on the second and Wakefield on the fourth; this gives Reading an event on the third,” Rushworth concluded.